Missing since the early morning hours of June 7, 1992. Two teenage friends, Suzie Streeter and Stacy McCall, were out the night of Saturday, June 6, 1992 celebrating their high school graduation. After attending a few parties, they decided to sleep at Streeter's home. Their previous plan was to spend the night at a motel and visit a local water park on Sunday. Streeter's mom, Sherrill Levitt, had spent her night at home, painting a chest of drawers. The young women returned to the Levitt-Streeter house. Family and friends found evidence that Streeter and McCall had taken off their makeup and prepared for bed. It is unknown what happened, but the three women went missing sometime between 2 a.m. and 9 a.m. that Sunday. Media and newspaper accounts tell that the women left the house without their purses. The light globe on the porch was shattered. The family dog was left unattended. How did the perpetrator(s) gain access to the home? Was it a ruse? How did the suspect(s) get control of the three women? What happened to them? 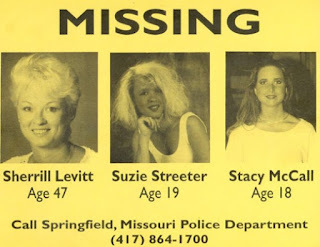 This case has stayed with me ever since I watched "The Springfield Three" episode of Disappeared on Investigation Discovery. The show featured footage of the graduation ceremony. It is heartbreaking to think that these two young women vanished only a few hours after celebrating their achievement. There have been several persons of interest, including Streeter's ex-boyfriend. A major person of interest is Robert Craig Cox, a convicted robber and suspected murderer. In another interesting twist, it was the family of the woman Cox was suspected of murdering, who informed police of Cox's presence in Springfield at the time of the women's disappearance. In recent years there has been a rumor that the women may be buried under the Cox South Hospital (no relation to person of interest, Robert Craig Cox). This is featured in the Disappeared episode, and to date, there has been no excavation of the site. Please visit the Streeter family's blog. They maintain a detailed site with a lot of information on the case. It has been more than twenty years since that summer night in 1992 and their families still have no answers. "The Springfield Three" episode of Disappeared tv show:. "Three Missing Women:Ten Years Later- Part 1 of 5". Springfield News-Leader. June 8, 2006.